spun with you and your guests in mind. Call, text, or email us today for availability! We are currently booking for 2019! PROVIDING SENSATIONAL AUDIO AND DIGITAL SERVICES FOR YOUR MOST MEMORABLE EVENTS! The perfect soundtrack to the best day of your life, spun with you and your guests in mind. From big days to school dances, holiday parties, to corporate gatherings, we work with you to create the perfect event, with YOU in mind. Our success is a result of our focus on what is most important, YOU! 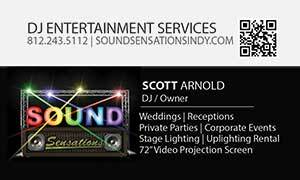 Whether you are planning your wedding or simply involved in the next corporate event or school party, you can trust Sound Sensations! Looking for a special gift for the bride and groom? Give them a gift certificate to Sound Sensations to be applied to their bill! Are you booking the Idle Creek Banquet Center or The Red Barn at Sycamore Farms? Ask us about special pricing! Call / Text / Email us today for available dates! We would love to be apart of your special day. Ask about our special pricing for venues like Idle Creek & The Red Barn.